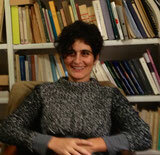 Tiziana de Rogatis (Ph.D. University of Perugia 1999) is Associate Professor of Contemporary Italian Literature at the Università per Stranieri di Siena, where she teaches comparative literature. Her doctoral thesis, on Eugenio Montale and other European poets from the 1920s to the 1940s, was published as Montale e il classicismo moderno in 2002. In 2011, she published an edition of Montale's Le occasioni and, in 2012, Mappe del tempo: Eugenio Montale e T. S. Eliot. The present focus of her research is on feminine identity and the mother/daughter bond, examined through the lens of a comparison between classical mythology and twenty-first century Italian and English literature. As part of the comparison between classical and modern, she has also proposed a contemporary rewrite of Aeneid for two plays (Segesta Aeneid, greek Theater of Segesta, 8/16/2008; Aeneas: fate and feelings, Bolzano's City Theatre, 19-11-2009 https://www.youtube.com/watch?v=rGgzZ4UZpTw).